Balentine (6-1, 180, University of Southern Mississippi) joins the Iowa Barnstormers for his third season with the team and his seventh season in the Indoor Football League (IFL). 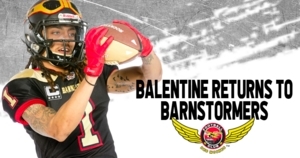 Balentine first joined the Barnstormers in 2017 after the team acquired him in a trade with the Cedar Rapids Titans. Balentine quickly made his mark in Des Moines as a leader on the receiver corps and stayed at the top of the league. Last season, Balentine appeared in all 14 regular season games where he collected 58 receptions for 645 yards and 13 touchdowns. Balentine was an integral part of the Barnstormers Championship run appearing in both post-season games. Balentine played a major role in the United Bowl Championship game, leading the Barnstormers to their first ever Championship victory and earning himself the title of Most Valuable Player.